plus read the proposed "Strategic Plan" for the cemetery restoration and inventory. This page includes both the Protestant and the Catholic cemeteries as they are together in the same location. All of Barclay Township was resorbed by Franklin when the population declined. This is from the inventory and survey by Todd M. Babcock, Professional Land Surveyor, November 24, 1993. 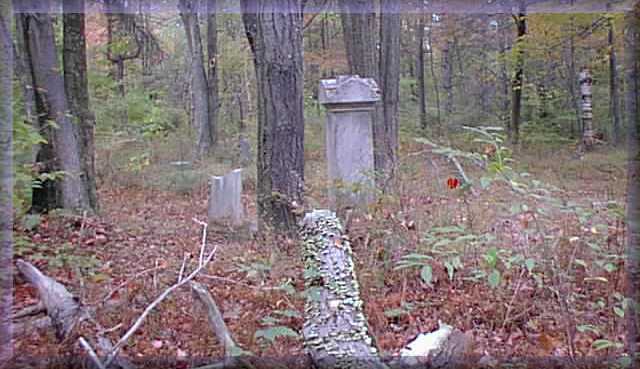 Barclay Cemetery is located in Franklin Township. It is a very large cemetery, completely taken over by trees. There is a base and part of a broken stone with no markings. - Only the top of the stone remains and it is severly eroded. There is a cross engraved at the top and it is lying on its probable base. There is also a mound 5' to the west. - The stone is in good condition and rests firmly in its base. There is a footstone engraved "E.C. J.C.". There is also a footstone engraved "A.R." This stone is severly weathered and is not legible. The stone is lying flat on the ground and is crumbling. The inscription is not legible. - The stone is in fair condition but it is leaning against its base. There is a cross engraved at the top. - Tle stone is broken in half and lying on its base. There is a footstone adjacent engraved "D.C."
This is the site of an unmarked grave. - The stones bottom is broken off and it is weathered. - This appears to be the top half of stone # 90. - The stone is lying on the ground. There is a large piece of the upper right corner of the stone missing. This is an unmarked stone leaning against a 10" tree. It appears that it may be a footstone. Aged 6 mos. Aged 8 mos. - The stone is in good condition. There are lambs engraved above both names. - There is also a stone marked "E.B." 3' west of this stone. - The stone is weathered but upright. There is a cross within a circle engraved at the top. This is the center mound of three mounds spaced 3 feet apart. - The stone is in very good condition, however the top has fallen off the base which has settled into the ground. The cap stone appears to have had a stone cross upon it but it appears to have been broken off. - The stone is upright and in good condition although it is weathering and becoming difficult to read. Aged 5 yrs & 8 mos. - The stone is upright and in very good condition. It is leaning back but appears to be firmly in the ground. There is a cross engraved at the top of the stone. Aged 7 yrs. & 6 mos. - The bottom 1/3 of the stone is broken off but is presently next to the top. There is a cross engraved at the top of the stone. There are also footstones to the south lying on the ground marked "D.M." and "E.M.". - It is possible that these are children of Edmond and Mary McDonald. - The stone is upright and in very good condition. - The stone is in good condition but is presently propped upright by a stick of wood. There is a lamb engraved at the top which is flanked by a cross on each side. Three footstones lying flat on the ground spaced 1'-2' apart. - The stone is in fair condition. It is leaning against a 15" tree. There is a cross engraved at the top of the stone. - The stone is broken at the middle and is lying flat on the ground. There is a raised cross at the top of the stone within an engraved circle. The stone is severely weathered at the center. Aged 1 year & 7 mos. - The stone is lying flat on the ground and is weathering. The stone is in fair condition and is leaning against a log. - The stone is setting rather precariously on its base since the base seems to have settled. The stone is cracked through approximatly 1/3 of the way down from the top. There is a cross engraved with the letters "I H S" inscribed upon it. - The stone is in good condition and rests firmly upon its base. There is a cross engraved on one side. - The stone is missing a portion of the upper left corner and is lying flat on the ground. This is probably the footstone for one of the Cantwells (stone # 106 or 107). Base with no marker nearby. - The stone is weathered and a portion of the top is broken off. The stone is lying flat on the ground. The stone is broken in two and lying nearly flat on the ground. There is no legible inscription. There is a footmarker nearby marked " M.H.R." Two small markers, both of which are broken. The larger of the two has a raised cross within an engraced circle. Both stones are lying flat on the ground at the base of a large tree. - This is a large arch top stone which is broken in two pieces. The stone is leaning against what appears to be its base. There is a cross within an engraved circle at the top. There is also a footstone nearby marked "J.D.". - The stone is in good condition and upright. - The stone is weathered and lying flat on the ground. There is a cross engraved at the top of the stone. - The top 1/2 of the stone has been broken off and rests against the base. The bottom half rests firmly in the base. The stone would otherwise be in good condition. There is a cross engraved at the top. - This is a large monument that is resting firmly upon its base. It appears that the sections of the stone may have been reassembled in the wrong order. The top section has a very ornate "M" engraved on the side. At one time there may have been a large stone cross at the top of the monument as I recall seeing a photgraph of a stone similar to this in my research of the Cemetery that had one on the top. This stone is broken into sevreal pieces. The top section has a cross engraved within a circle. - This stone has been broken into two pieces which are propped up upon the base. There is a cross engraved within a circle at the top of the stone.